They’re the latest weapon in the fight against obesity. Here’s the scoop behind weight-loss betting sites—and how you and your clients can get involved. There’s never been a better time to slim down. With all of the weight-loss gadgets flooding the market, from Smartphone apps to smart trackers, your clients can stockpile a wealth of tools to help them battle the bulge. Of course, they still have to do the work, but studies have shown that many of these aids can help them drop unwanted (and unnecessary) pounds. And now another relatively new tool is promising great gains, both on and off the scale: weight-loss betting sites. The stats on how many people are successful at losing weight and maintaining that loss are bleak at best. While 45 percent of adults were successful in losing weight during a 12-month period, two-thirds of those dieters were unable to keep the weight off past six months, according to a 2011 survey from the Calorie Control Council. Yet dangle a carrot—in this case, money—in front of these dieters, and the hope is that they’ll be able to succeed in the long run. Incentives, of course, are nothing new when it comes to encouraging people to lose weight. Yet science has shown that money can be a powerful motivator. When people knew they were being rewarded with money (even though they were the ones contributing between one cent and $3 a day, which they would get back if they met or surpassed their weight-loss target), they lost an average of 14 pounds over four months, according to a 2008 study published in the Journal of the American Medical Association. 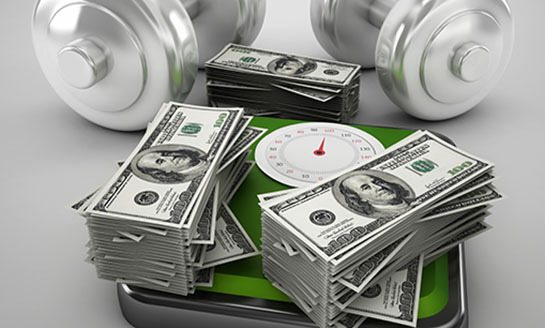 Individuals without the financial incentive, however, lost only 4 pounds on average. At DietBet, for instance, people decide how much money they want to bet, pick a start date for their game (each one has to have at least two players) and then commit to losing 4 percent of their initial weight in four weeks, logging their weight on days 1 and 28. Players can then interact with each other via message boards. Everybody who loses 4 percent in four weeks is deemed a winner, and they split the pot. And people are losing. At DietBet, for instance, 93 percent of participants lose weight; the average is 6 pounds, 9 pounds for winners. “Our primary audience is the frustrated, but optimistic dieter who’s probably 5 to 40 pounds overweight,” says Matt Daniel, vice president of business development of DietBet, adding that the majority of participants are women. The average bet is $30, and winners usually claim two to three times their initial bet. HealthyWage offers three programs that pay people to lose, including the 10% Challenge (participants pay $150, and if they lose 10 percent of their weight in six months, they earn $300), the BMI Challenge (a free program where participants earn $100 if they lower their BMI from above 30 to below 25 after 12 months or they can bet $300 to try to win $1,000), and the Matchup (participants pay $75 total to enter a three-month competition that pits teams of five against each other; winners could snag $10,000). The company is slated to launch a cash-incentive program for weight maintenance this spring. Yet while DietBet and HealthyWage operate off of incentives, another site, stickK, takes it a step further, offering not only incentives, but also consequences if participants don’t meet their goals. “stickK is based on behavioral economics and loss aversion, meaning that people will work harder if they know they might lose something,” says Sam Espinosa, stickK’s director of marketing. Through stickK, individuals create a commitment contract where they set a goal (37.5 percent choose weight loss) and timeframe (average is 21 weeks). It’s up to each player, though, to determine if they want to put money on the line (roughly 30 percent do). If players opt for financial stakes, they choose a “referee” to confirm their progress (if they’re aiming for weight loss, they have to weigh in weekly; stickK actually figures out how much they need to lose each week based on their goals) and then determine where that money goes if they don’t meet that goal. Options include a friend, charity of stickK’s choosing or an anti-charity—an organization whose views that player opposes. For instance, a Democrat could choose to send his or her money to the Republication party. Interestingly, when people choose the referee and stakes, the success rate is 61.4% versus only 22.3% with no stakes and no referee. These sites aren’t just helping people lose weight. They’re also expanding business opportunities for personal trainers. Meet Sarah Dussault, YouTube fitness guru and Boston-based trainer, whose worldwide clientele is primarily online. 1. Lack of weight verifications. When wagering money against weight loss, your weight should have to be verified by a third party. “If there’s no verification from a credible third party, assume this program has problems,” Roddenberry says. 2. Requirement to purchase a third-party product. If the site makes you buy food, supplements, clothing or other products to win money, stay away. 3. Inaccessible support or service. Have questions for the company before signing up and can’t reach them? Do more research to make sure it’s an established business. 4. Nonexistent social media following. The company should have a presence on Facebook or Twitter, giving you a place to ask participants about the program and confirm that they were paid any money they’ve won. 5. Little or no search results. Getting paid to lose weight sounds too good to be true, which is why any credible company should have had numerous articles or mentions about it when doing a search online. If not, move on. 6. No media coverage. Read about a company in a magazine or newspaper? “You can feel comfortable that program is legitimate,” Roddenberry says. 6. No media coverage. Read about a company in a magazine or newspaper? “You can feel comfortable that program is legitimate,” Roddenberry says. In January, Dussault kicked off her largest DietBet (it’s her third one) with more than 700 participants. As the organizer of each bet, Dussault interacts with participants, posting messages to the group or responding directly to individuals. While the cash is a sweet reward for participants, Dussault also offers giveaways—NatureBox, which delivers a monthly box of healthy snacks, was the most recent—from health and wellness companies she’s partnered with. The boost her business has received is so positive—“I’ve not only gained new clients, especially since people invite their friends to join them in my DietBets, I’m also maintaining my current client base, which is what any personal trainer wants”—that she’s now contemplating running a DietBet to coincide with each “diet season,” roughly five a year. Another benefit? “Doing these bets expands your ability to create an international or global brand,” she says. So how can you get involved? At a minimal, you can volunteer to verify the weight of participants who are betting through these sites. HealthyWage, for instance, requires weight verification from a health club or personal trainer at the start and end (three, six or 12 months) of every game. While more than 5,000 health clubs have agreed to be verification sites, personal trainers can also get involved by visiting www.HealthyWage.com/affiliates and applying to be a HealthyWage Ambassador. Along with perhaps introducing you to new clients, you’ll also earn $15 for each individual who signs up for a HealthyWage program through you. You can also introduce your clients to stickK and volunteer to be their referee, which then creates accountability between you and your clients and gives you another way to engage with clients, Espinosa says. 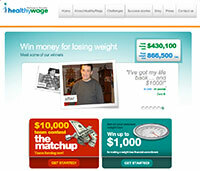 Or you can step it up a notch and organize your own bets through sites like DietBet and HealthyWage. Bets take only a few minutes to set up, and require you to do little more than invite clients to play and serve as their coach throughout the game. To sweeten the pot, you might offer additional incentives like free or discounted personal-training sessions. If you run a health club, by the way, all of these sites offer opportunities to customize and market large-scale weight-loss bets, which could drive member retention and attract new members. Karen Asp is a journalist, ACE-certified Fitness Professional, contributing editor for Woman’s Day and co-author of Understanding Your Food Allergies and Intolerances (St. Martin’s, 2012). She also writes for numerous other publications, including Self, Glamour, Whole Living, O, Family Circle, Redbook, Real Simple, Prevention, Redbook and Men’s Fitness. Follow her on Twitter (@karenaspwriter).